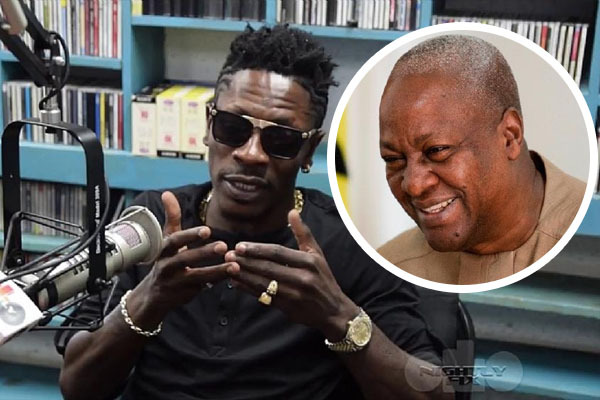 Ghanaian Dancehall artiste, Shatta Wale has said his numerous calls to ex-President John Mahama ever since he lost the 2016 elections have gone unanswered. Shatta Wale’s ‘Mahama paper’ hit song was adopted by the then ruling National Democratic Congress (NDC) party as its campaign song and was heard blurring from speakers whenever the party was holding an event. He climaxed the final rally of the NDC two days to the election day at the Accra Sports Stadium with an epic performance to the delight of over 40,000 teeming supporters, where President John Mahama, First Lady Lordina Mahama and other party officials did not hesitate to show off their dancing skills to the tunes dished out. But speaking with Gattuso on Kasapa 102.5 FM on the ‘Aben Wo Ha’ Show, the ‘Kakai’ singer pleaded with the top hierarchies in the biggest opposition party NDC to alert the Ex-President to consider picking up his calls. “I’ve been calling the Ex President after the elections and he hasn’t been answering. I don’t know the reason why but I believe is because they are busy putting things in place after their lost.” He said. The award-winning dancehall artiste paid a courtesy call on President Nana Akufo-Addo at the Flagstaff House on Wednesday, November 1. Nana Akufo-Addo, on Tuesday, October 17 tweeted to wish Shatta Wale a happy birthday in pidgin English and invited him over to the Presidency. President Akufo-Addo also presented the Dancehall artiste with a gift of Ghana’s Coat of Arms.